One-third of the world’s girls are married before the age of eighteen, limiting both their educational and economic potential. Child marriage is damaging to global prosperity and stability, yet despite the urgency of the issue, there remains a significant lack of data on the subject. 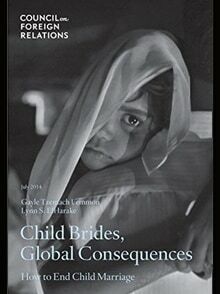 Senior Fellow Gayle Tzemach Lemmon discusses both the factors that contribute to and strategies that have proved effective against child marriage.